Not so long ago, it was widely believed that there were very few distinct morel species - indeed, some authorities recognised as few as just three worldwide. Latterly, molecular studies have shown that there are several dozen separate species and that, for example, European and North American morels which may look very similar are in most cases not cospecific. For most amateurs, however, two phylogenic clades (groups closely related in evolutionary terms) are of particular note and are represented on this website. The first of these groups comprises close relatives of the yellowish morels, and generally they seem to be associated with broadleaf trees, possibly even with some form of mycorrhizal connection. 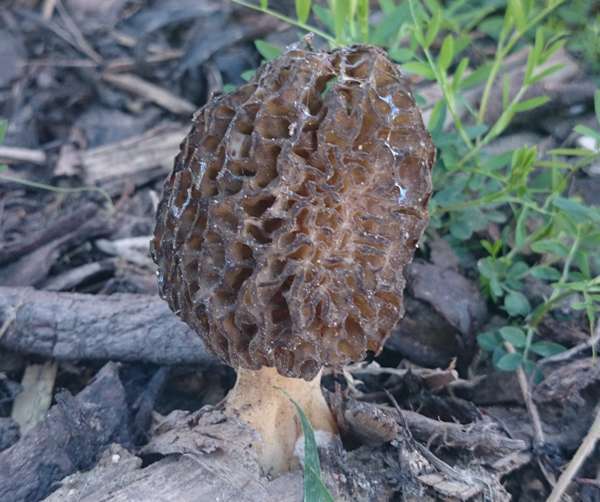 The other clade of note that is commonly seen is relatives of the so-called Black Morel Morchella elata and its relatives, which is found on woodchip mulch and may form some kind of ecological association with conifer trees. Morchella esculenta, the Morel, fruits from March to June and is a very popular edible fungus, although not common in Britain and Ireland. The flesh is rarely ruined by insects or other small creatures, but stems can be pierced by bugs that find the cavity within the cap and stem a handy hideout. Before cooking Morels, slice vertically through each fruitbody to check for occupants. Mainly found in chalky woodlands, Morchella esculenta occasionally appears also on disturbed soil in gardens. 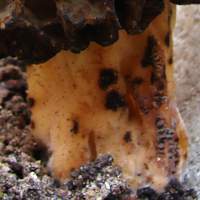 Infrequent finds in Britain and Ireland, Morels (sometimes referred to as Common Morels or Yellow Morels) occur throughout Europe. They are also reported from many Asian countries and from sites throughout most of North America. This renowned edible mushroom is a very rare find in Australia, where several other members of the genus Morchella are known to occur. The present scientific name Morchella esculenta dates from Christiaan Hendrik Persoon's 1801 publication. Other synonyms of Morchella esculenta include Helvella esculenta (L.) Sowerby, Phallus esculentus L., and Morchella rotunda (Fr.) Boud. 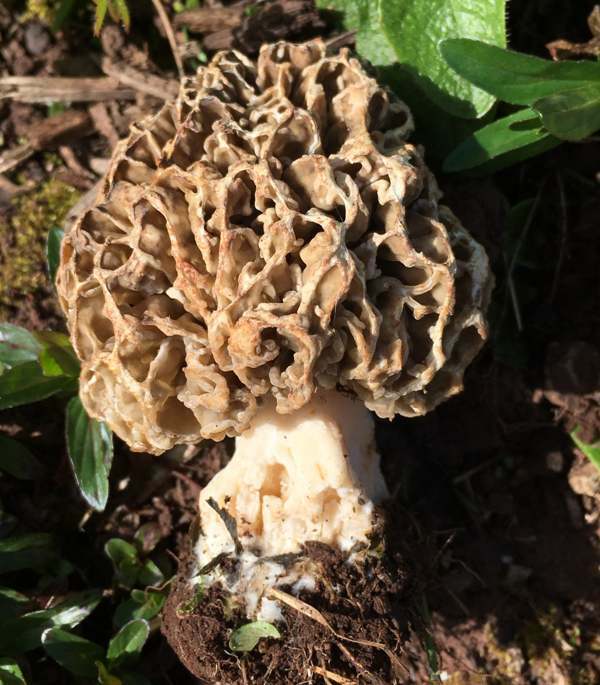 The generic name Morchella is said to come from morchel, an old German word meaning 'mushroom', while the specific epithet esculenta is Latin and simply means edible. Edible Mushroom seems like a very good name for this species! Although they are highly prized edible mushrooms, Morels of all types must always be cooked thoroughly; otherwise they can cause severe stomach pains and sickness. 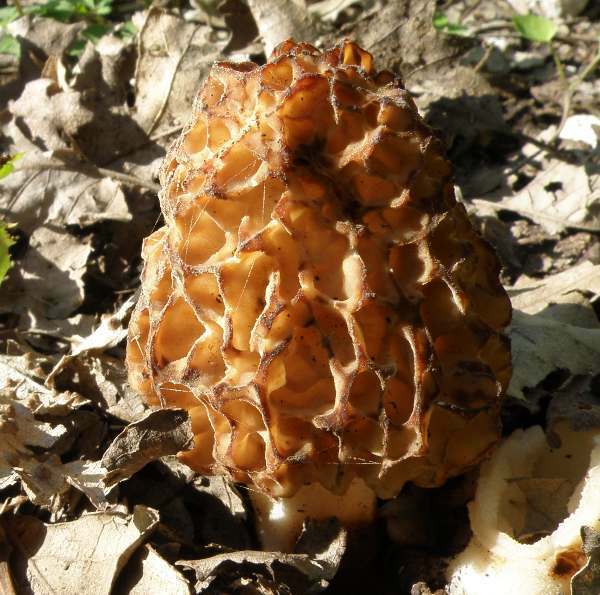 There is a risk of confusing Morchella esculenta with the deadly poisonous False Morel Gyromitra esculenta, whose cap has a brain-like surface rather than a pitted surface. The remarkable picture on the left, taken in a garden in northeast Suffolk, England in early April 2014, shows a slightly darker than average (but far from untypical) Morel, Morchella esculenta, growing in sandy soil beside a concrete gravel board. 3 to 8cm across and 5 to 12cm tall, sometimes conical, but more often globular or an elongated vertical oval, the caps of Morchella esculenta have waxy flesh. Caps are hollow and are covered in an irregular array of pits separated by narrow ridges. The colour varies from pale cream, to ochre, to yellowish brown or mid brown, usually darkening somewhat with age. The ribs along the ridges between pits are usually slightly paler than the interior of the pits. Cap margins are inrolled and fused to the stem. The fertile surfaces, which are lined with spore-producing asci, are within the pits, while the ridges are infertile. White or pale cream, sometimes marked with brown blotches near the base; flesh tough; hollow; smooth; 3 to 12cm tall and 1.5 to 6cm diameter at the base, usually tapering towards the apex. Typically 260 by 20µm, cylindrical, hyaline; eight spores per ascus. Ellipsoidal, smooth, 17.5-22 x 9-11µm; hyaline. Creamy white or pale ochre. On chalky soil under deciduous trees; occasionally with dwarf willow on calcareous dune slacks. It seems likely that at different phases in their development the underground mycelia of Morels may be able to behave either symbiotically with trees (in an ectomycorrhizal relationship) or as saprotrophs. March to early June in Britain and Ireland. Morchella elata has a darker pitted cap with cupped surfaces aligned in columns; it is usually more pointed. Gyromitra esculenta has a red-brown, brain-like cap and a sem that is hollowed into several chambers. Helvella crispa has a fluted, broader stem with external grooves and internal hollow channels. We always dry our Morels, partly because we are convinced that the process improves their flavour but mainly because they are too good to have them available only in springtime. Dried Morels in a sealed container last indefinitely. Morels are very good when fried in butter and served on toast with a creamy sauce. We also make mushroom soup and serve it in dishes with one whole Morel floating in the middle with a small splash of fresh cream. Last, but probably best of all, Morels are marvelous when served with a meat dish such as beef or pork and a selection of roasted vegetables. This page includes pictures kindly contributed by Simon Harding and Anthony Payne.